Getting this compensation does not have to involve a complicated legal battle or endless hours arguing with insurers. At The Weinstein Law Group, PLLC we will help you get the money you need. It is possible your case can go on for months or even years; however, you do not have to wait to start getting benefits. The state of New York has what’s known as “no fault” benefits: they pay for your medical expenses right away. They also pay a portion of your lost wages if you can’t work because of your accident. The total paid out can be as much as $50,000. The first thing we do when we start your case is apply for no fault benefits. The insurance company cannot deny you these benefits, even if they say you caused the accident. No fault benefits are applied even if the accident was your fault. Although you are entitled to these benefits, you need to act quickly. To file a no fault application you need a copy of the police report. We’ve found that these are only available at the local precinct for just a few days to a week. After that they’re sent upstate and take a lot longer to request. This delay leaves you in limbo, with medical bills piling up but no benefits until you can get the paperwork you need. We can handle this entire process for you by dealing with the bureaucracy and making sure you get your benefits as fast as possible. We will also make sure you are properly examined and that all your injuries are included in the medical history of the case. What Counts as a “Serious Injury”? 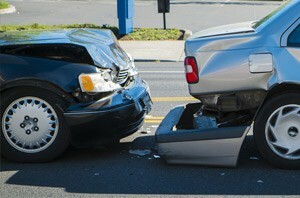 Many car accident injuries will end up costing you more than the $50,000 allowed by no fault benefits. This is where you have to fight for your right to compensation, and having a skilled lawyer makes a significant difference. The state of New York will not allow you to get more than $50,000 unless you have what they consider a “serious injury.” Without this determination, your case won’t even make it to court. Sometimes what counts as a serious injury seems subjective. Other times it starts out minor and then gets worse, like back pain that turns into a herniated disk. You don’t have to argue with insurance companies over the severity of your injury if your case is properly documented. The medical record will show exactly how serious your situation is. At The Weinstein Law Group, PLLC, we will get you in front of the medical specialists who understand your type of injury and document everything. We’ve all heard that you shouldn’t take the first offer the insurance company makes. They may offer you $7,000 immediately if you sign away your right to seek $100,000 later on. This may not be as common as it sounds, but insurance companies have other tactics they use. One of these tactics is the insurer simply sitting on your case. They’ll tell you they’re investigating but don’t call for weeks. They know you want a resolution for dealing with injuries and medical bills. Then they finally call, they say they need a statement to process your claim. This is the trap: they want you to slip up and say something foolish on the phone. Then whatever you said haunts you for the rest of your case. You only have an obligation to cooperate with your own insurance company – not the other person’s. Never give a statement unless your lawyer is present. You are not required to say anything. “Cooperating” with your own insurance company is as simple as giving them your lawyer’s name and phone number. You don’t have to offer any more than that. Steven Weinstein has 30 years of experience representing auto accident victims, and a long track record of success that goes back to his first year practicing law. He has won multi-million dollar verdicts for accident victims. He knows what it takes to get you the financial compensation you deserve. Most importantly, Steven charges nothing unless you win. If you don’t get a positive verdict or settlement, you pay absolutely nothing. We know that you have enough bills to worry about thanks to the accident: the last thing you need is a legal bill as well. We will help you get the care you need right away, and you pay us nothing unless we win your case. It’s important to move quickly at every stage of your case. New York has strict deadlines for filing injury claims, and you get nothing if they pass. That can leave you with medical bills that last decades. Call The Weinstein Law Group, PLLC and talk to us about your case. Our free consultation can help you decide what to do next. Call us today at 212-741-3800 or fill out the case form and get started. Complete this form and our team will get back to you in 24 hours or less.